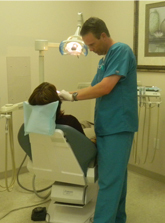 Dr. Honore’ believes in using the most effective technology for your dental health and appearance. Scientists now have evidence showing that your oral health and overall health are connected, meaning that problems in your mouth can affect other important parts of your body! With that in mind, our goal is to help you prevent, or detect early on, any potential problems. When you come to see us, we gather comprehensive information about you and develop a preventive treatment plan tailored to your needs and goals. We also educate you about the proper techniques for taking care of your teeth and gums (for example, there is a right way and a wrong way to brush), so that you can maintain your radiant smile. As you can see from the following list of services, our approach to preventive care is quite thorough. Education for prevention including proper brushing methods and tips for preventing bad breath and tooth decay.